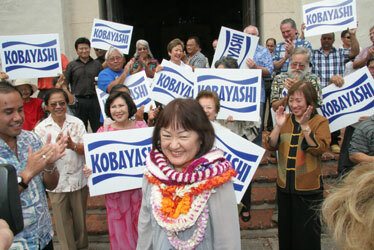 Supporters cheered Ann Kobayashi at City Hall yesterday after the city councilwoman filed papers to run for mayor. Mayor Mufi Hannemann appeared to be on his way to a re-election campaign unchallenged by any seasoned politician. But yesterday, the last day for candidates to file for election this year, City Councilwoman Ann Kobayashi shook up city and state politics by announcing that she will run for mayor. Her surprise move had immediate repercussions for the City Council and the state Legislature and led to last-minute scrambling at the state Elections Office. Former City Councilman Duke Bainum quickly filed to run for Kobayashi's Manoa Council seat. Democratic House leader Rep. Kirk Caldwell followed on Bainum's heels to file for the same race. Caldwell took aim at Bainum, who left local politics after losing to Hannemann in the 2004 mayoral election. "Where has he been for four years?" Caldwell asked. The city contests promise to spice up an election that will otherwise see an unprecedented number of unopposed races. City Councilwoman Ann Kobayashi entered the mayoral race yesterday, becoming the most recognized candidate to challenge Mayor Mufi Hannemann. In one of the biggest political surprises of the year, council member Ann Kobayashi files to run for mayor, her supporters say now it'll be a real race for incumbent Mufi Hannemann. She said she wanted to give a voice to the people of Oahu on rail transit and other issues. After Kobayashi's 11th-hour announcement yesterday on the last day for candidates to file for election, Rep. Kirk Caldwell, former City Councilman Duke Bainum and Democratic Party insider and former union official George Waialeale filed to run for her open Manoa-Moiliili Council seat. Kobayashi, 71, who had earlier denied rumors that she was considering a run for mayor, said seeing how Hannemann handled the public debate on the city's $4 billion rail transit system had motivated her to challenge him. "We need to take the city back," Kobayashi said yesterday afternoon as she filed papers at Honolulu Hale in front of about 50 supporters. "We should be encouraging people to get involved in the voting process instead of discouraging them and throwing up roadblock after roadblock." The city's proposed 20-mile rail transit system is quickly becoming the most visible issue in this year's mayoral election. Panos Prevedouros, a vocal critic of the rail system and a University of Hawaii at Manoa engineering professor, has garnered some support for his mayoral bid. "I think the 2008 elections are for change," Prevedouros said. "I believe I represent change. Electing Ann, with all due respect, would be one career politician replacing another career politician. That is not change." Hannemann issued a short written statement yesterday, saying: "I welcome all of the candidates to the race. I look forward to a spirited debate on the issues and the future of the City and County of Honolulu." Kobayashi said she supports mass transit, but disagrees with Hannemann that a steel-wheel-on-steel-rail system is the best technology for Honolulu. She supports a rubber-tire-on-concrete system. Prevedouros and Kobayashi acknowledge that they face a tough campaign against Hannemann, who has collected more than $2.5 million. A mayoral candidate can win the office in the Sept. 20 primary by gaining at least one vote over 50 percent of the ballots cast. If no candidate wins a majority of votes, the top two candidates would face off in the Nov. 4 general election. 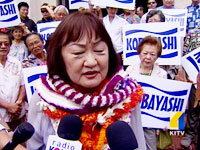 Some of Kobayashi's supporters include several Hannemann critics: former Gov. Ben Cayetano, Senate President Colleen Hanabusa and City Councilmen Donovan Dela Cruz and Charles Djou. Djou and other local politicians had been pushing Kobayashi to run for mayor for months. Cayetano, who has clashed with Hannemann recently in a public debate over the elevated rail system, said in an e-mail to the Star-Bulletin: "Ann will make a fine mayor. She's honest and straightforward. She is a longtime friend and co-chaired my 1998 re-election campaign. (Would I) support her? Of course." This is Kobayashi's second run for mayor. She ran unsuccessfully in 1994 after serving in the state Legislature for 14 years. She was elected to the Council in 2002 and has been representing the Manoa-Moiliili area for eight years.